the implementation of a short continuum of consequences. An after-school detention is a common response to repeated misbehavior. 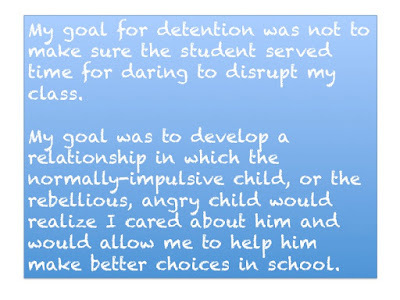 I learned to love detentions when I realized how 20 minutes of one-on-one time with a student changed my relationship with him or her, and how that changed relationship quickly changed the student's behavior in my classroom. My classroom discipline system called for three re-directs to each student, each with a little more intrusive consequence, before a referral to the office. Step one was just a warning, a request to start or stop doing something. Step two was the dreaded SENTENCES assignment. I required students to write twenty-five times for the next day's class, the following sentence: I have all the self-control I need to do the right thing always. This turned out to be a very controversial decision. Fellow-teachers claimed that using writing for a consequence would make kids hate writing. I maintained that, since it made kids hold and use a pencil more than they had been doing, it actually contributed to their stamina for the act of writing. Besides, copying a sentence is very different from composing a paragraph, story, or essay. Some parents were infuriated by this consequence. Their child could be doing their school work instead of copying a sentence over and over. 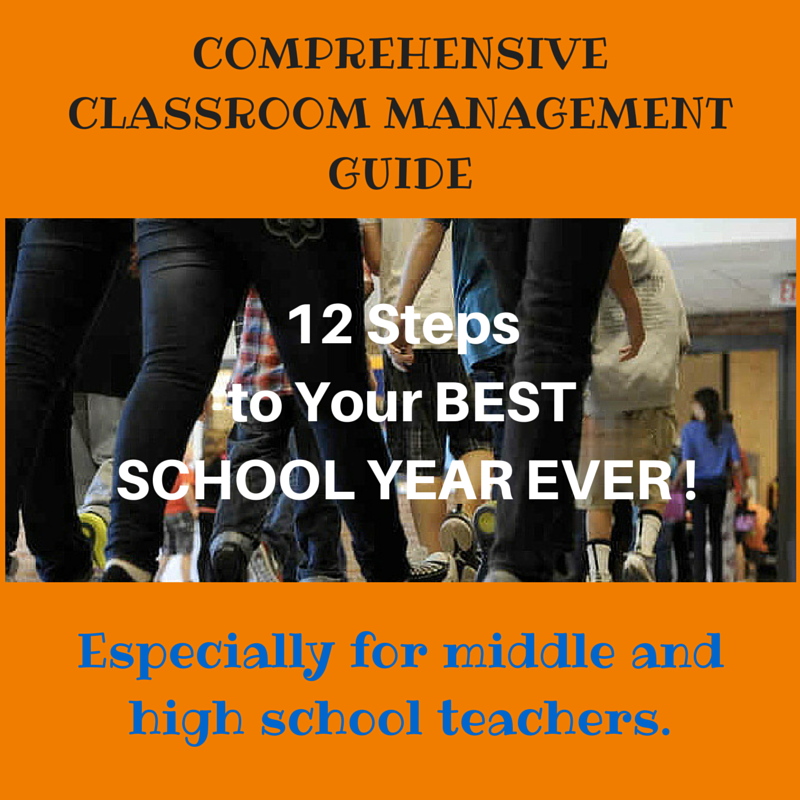 I agreed, but I still needed a mild-ish classroom consequence. 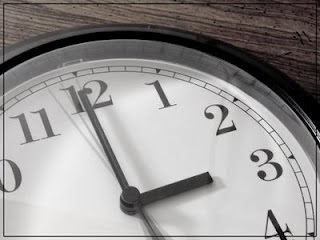 I knew that 25 sentences took most kids less than 30 minutes to complete. They could write them in a dentist's waiting room, in the car or on the bus, or on the couch in front of the television. I suspected that protesting parents were offended by the content of the sentence. Perhaps they felt I was judging their child as lacking in self-control. Actually, I judge almost all impulsive youth as lacking in self-control. I really just wanted a relatively short statement that would be useful for someone to rehearse, a confession more positive than "I will not talk in class." If a parent was set against this consequence, I just answered, "If you don't want me to issue sentences for your child's consequence, I can skip that step. I'm just trying to keep order without having to send kids to the office." Most parents appreciated my motivation. Detention was step three. If I had to talk to a student about misbehavior for the third time in a period, the student had to meet with me for 20 minutes after school. I also assigned a detention if a student failed to bring his sentences when they were due for misbehavior the day before. When a student came to detention, I told him that every sentence he wrote in detention counted for two, and I would write five of them myself. My students were almost always shocked that I would sit next to them and help them complete their consequences. My goal for detention was not to make sure the student served time for daring to disrupt my class. 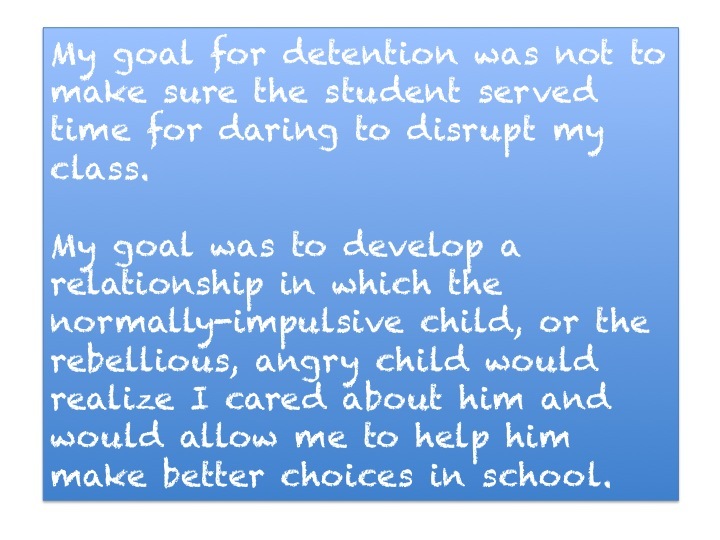 My goal was to develop a relationship in which the normally-impulsive child, or the rebellious, angry child would realize I cared about him and would allow me to help him make better choices in school. While we copied sentences, I asked about my student's family, his school history, his favorite class, his struggles. I asked how I could help him be successful in my class or throughout his day. I asked him why he thought I had rules and gave consequences. I wanted to overtly clarify my heart's intention for discipline. There's nothing like a one-on-one conversation, on an equal playing field, to diffuse anger and gain cooperation with a young person. The student started to see me as a person who cared, rather than an authority figure bent on punishing kids. Some kids can't do well in school unless they know they are seen, noticed, understood, and appreciated. Sometimes I learned that a peer was bullying a student, and he acted out to call my attention to the situation. I almost always discovered that kids wrestled with tremendous struggles in their daily lives, and my willingness just to listen to them for a few minutes gained significant cooperation from them. Through these experiences, I learned to always seek to make kids successful with the lesser consequences and to use my precious 20 minutes alone with one child - or a few children - to foster positive and trusting relationships. 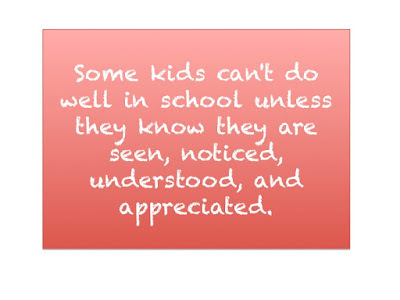 Our students don't extend respect to adults just because they are adults. We have to earn their trust and their regard. Once we gain it, though, many of our kids become fiercely devoted to us. Teachers often want to send all kids who earn a detention to one teacher for supervision. This is a decision made for the convenience of adults, at the expense of the kids. Actually, it does not benefit adults either. I want my consequences to pay off for me in my classroom. 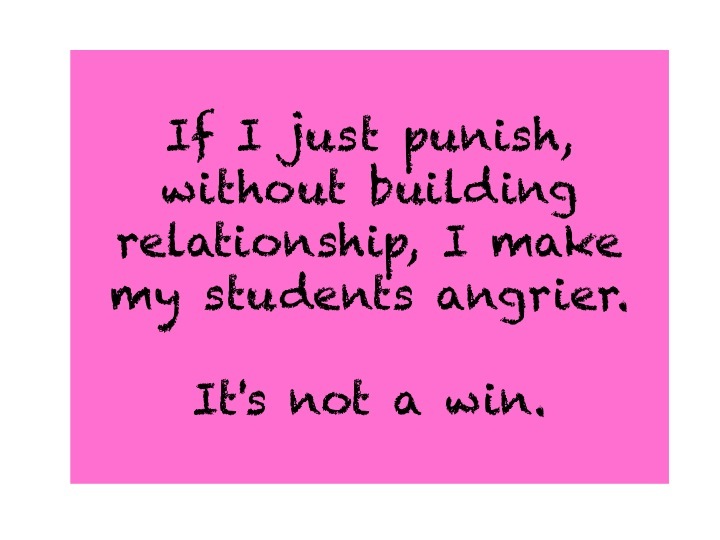 If I just punish, without building relationship, I make my students angrier. It's not a win. I would never give my detentions to another teacher to supervise, if I could help it. Once I learned to love detentions, I noticed a leap in my confidence level related to issuing consequences. Because I knew how much detention time could change our relationship, and how much cooperation I could gain from each student, I did not hesitate to assign consequences when students' behavior called for it. 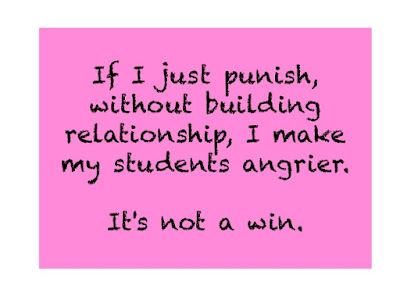 As my relationships with individual students grew, more and more kids seemed to want a taste of my consequences. Several students asked me to assign them sentences, even though they didn't misbehave. They wanted that experience, for some reason. Others asked if they could stay after with me, just to talk. I would never have enjoyed that result if I had been frustrated or irritated by having to correct student behavior, or if I had ceded the supervision of my detentions to another adult.